Speaker stands...do they make a difference? Discussion in 'Audio Hardware' started by mike catucci, Apr 8, 2015. I am not sure if I should shell out a couple hundred dollars for proper stands or not. Right now my bookshelves sit atop two identical short bookcase type pieces. These are the kind you purchase for 60.00 at your local KMart, Target, etc.. and screw together in about 20 minutes and then throw CD's or books etc. in them. They are roughly 12 x 12 and filled with CD's right now so they are heavy. I'm also lucky in that the height works out so the tweeter is at ear level when I sit. Will I notice an improvement by going with proper speaker stands? DeRosa, David Ellis, Joshua277456 and 2 others like this. I've got Pergo floors (laminate or fake hardwood floors) how do you approach that with the spikes? I could cut some carpet squares and place the spiked stand on top of that. Would that be ideal? After I noticed some indentations in my vinyl floor, I stuck pennies under the spikes. Konforti and mike catucci like this. You might be better served to just decouple them from the book cases, especially if said cases are solid and don't move too easily. 90% of what stands will do is position the speakers at the proper level for your listening position, which it appears your cases are already doing. Since you would likely do this with the stands anyway, it would be worth the time to do it before spending the $$ on stands. There are quite a bit available in this field, however, I had great results just using little rubber sticky pads from a local craft store. Worth a shot. Shak Cohen, Dave, mike catucci and 1 other person like this. You don't necessarily need spikes. Spikes will accentuate the bass, but that may not be what you need. If your situation has the tweeters at ear height, the primary improvement will probably be in the bass. Skylan does custom stands for a decent price. They come with a screw-in foot with a plastic contact surface and also with spikes. I replaced the feet with Herbies gliders, which also changed the sound. In fact, what you choose to fill the stands with will change the sound. Probably worth the investment because of the ability to tune the stands and change placement easily. SandAndGlass, bluemooze, Joshua277456 and 6 others like this. You have some very nice bookshelf speakers (Ascend Acoustics Sierra 2) according to your profile, so my answer is yes. Most definitely invest a good pair of stands. Sailfree and mike catucci like this. Thanks guys for the replies. A few of you have mentioned getting a "good" pair of stands. Is price indicative? Should I get something that can be sand filled as well? Some are welded metal tubing, others all MDF, or plastic tubing with MDF bases. Something that can be filled is a good place to start. Honest truth. If you like what you hear leave it & enjoy the music . sami, mike catucci and Robin L like this. I would recommend getting stands that can be filled so the option to try that out is available. Some of the best money I've ever spent on my music was when I took the plunge and bought a good five-shelf Target rack and a pair of Atacama speaker stands for my (still fabulous after all these years - 18 and counting) Epos ES12 standmounts. Even as I was handing over the money I was thinking ''I could get a LOT of CDs with this cash'', but it was worth every penny - around £280 in 1997. Alan2 and mike catucci like this. The distance from the listener, how close they are in relativity to the back walls, also reflective qualities of the room all come into play. Using stands will place the speakers roughly at listening level. They will also allow you to toe the speakers. I personally feel the height weighs in more than the toe in/out but that is up to you to determine through listening. I could see running into some issues just placing them on a shelf. It's one of the cheap and easy ways of getting better sound. Proper speaker placement will give you a much better image of the music than expensive cables and such. As would treatments for the room (more difficult to figure out than the former). GuildX700, Tommy SB, mike catucci and 1 other person like this. I should clear up something...I am getting excellent imaging already. The speakers sit atop a small bookshelf type case, they are not enclosed, they sit on top of the last shelf and there are not sides or back to deal with, they are wide open. I can also move them for toe in but have found the best results are when they face forward. I am told this is typical with the Raal ribbon tweeter. Good stands definitely make a big difference IME. ssmith3046, mike catucci and Johnny Vinyl like this. I've founds stands to be essential for bookshelf speakers. The imaging can be wonderful, but it takes a LOT of time and patience to get it right. How do spikes accentuate the bass? ssmith3046 and mike catucci like this. 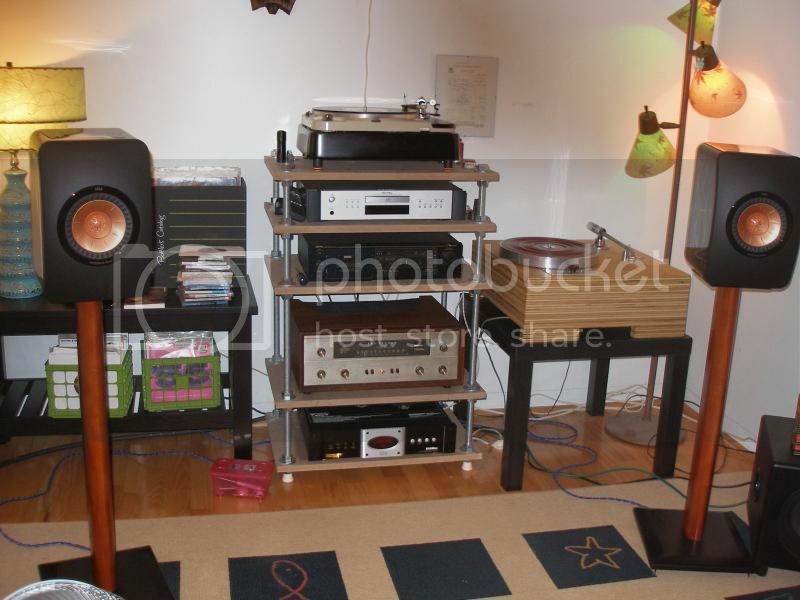 You may have, inadvertently, made proper speaker stands. The physical locations for your pair of speakers will affect the sound more than just swapping out the speaker stands. That said, I have found that floor-standing speakers make for the best speaker stands. For the same amount of money as bookshelf speaker plus stand, you get the same sized footprint and another octave of bass. And yes, good speaker stands can make a difference. I'm a DIY type myself. Your current stands are mass-loaded anyway, I'd experiment with blu-tack and improvised spikes with your media rack. My concern would be the CDs rattling. SandAndGlass and mike catucci like this. Check out Skylan stands. Good looking and they get lots of favorable reviews. I read years ago that the best speaker stands for the money were concrete blocks. A friend of mine who happened to be a brick layer and a big fan of bookshelf speakers made 3 block high stands, spray painted them black, and loved them for years. I have used a block under each speaker in my den for about a decade and do not plan on upgrading any time soon. i think so.i have my PSB image B 25's on stands that cost around $100.the stands them selves have spikes which isolates the stands from the floor and i also isolate the speakers themselves from the stand.the name escapes...atlantis i think....and my system sounds really really good so i think this helps. Yeah? What are you using, and what did you use before? I'm using a pair of inexpensive Sanus stands with my LS50's, and have wondered if I'm missing something by not using something fancier. Indeed you are. For one thing, stands need to be mass loaded. If you can find a pair of the excellent Sanus Ultimate Foundations in the right height, buy'em quick because they don't make them any more. Skylan also makes an excellent stand. Speaker stands, yet more money for me to spend in the next few weeks.